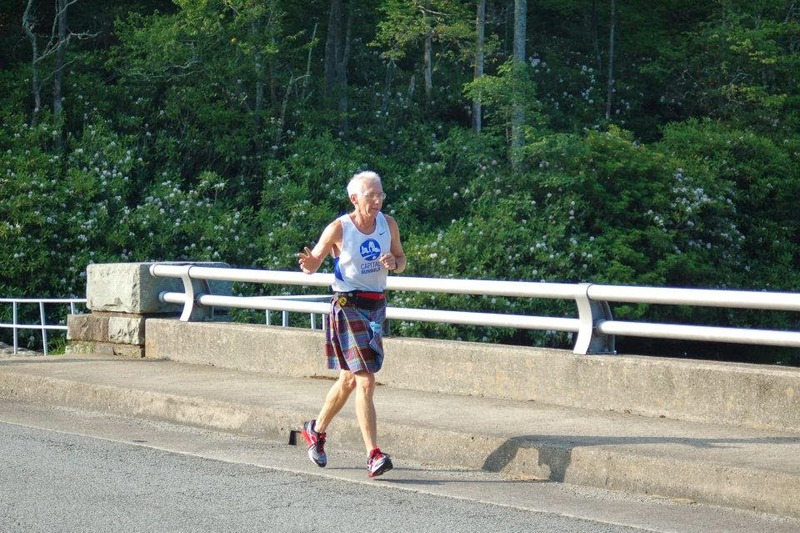 runjoey: Grandfather Mountain Marathon 2014 .And a little extra ! 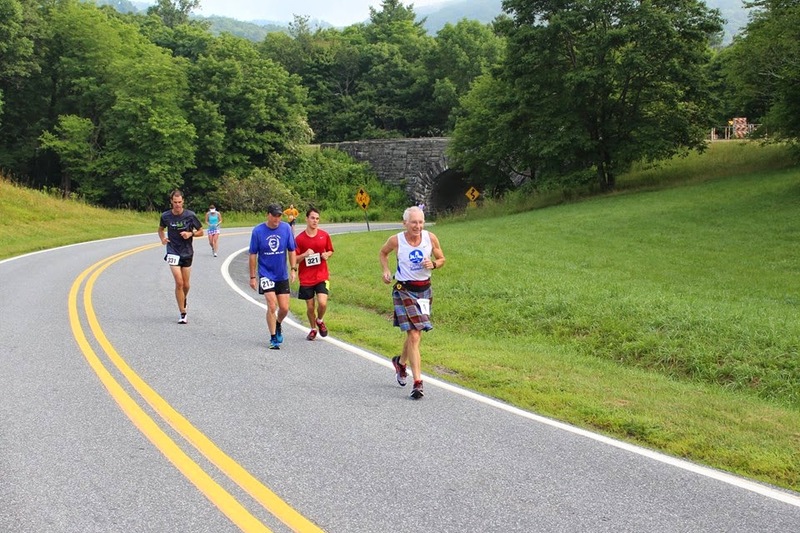 Grandfather Mountain Marathon 2014 .And a little extra ! I had another nice trip to the mountains in July for a fun race and a little escape from the heat of the flatlands. Arrived in town about 4 pm Friday and took a little drive as far as I could go on the "fire tower" run that Bobby Cordell runs frequently. More on that later. I came back down the mountain and went for packet pick-up where I saw several friends and then headed to the Meigs cabin for a wonderful dinner with their family and a lot of the Zap Fitness staff and athletes. Arrived at the stadium on race morning about 30 minutes from the start and spent the time visiting with friends before lining up on the track. It was comfortable in my singlet which meant it was a bit too warm but nothing I can do about that. I thought I was holding back the first mile but it is all flat or downhill and I passed that first mile in 8:12. Too fast but it felt like a jog so I didn't worry and just relaxed and slowed down a little for mile two. Shortly after that is the first climb as we turn onto Winklers Creek Road and I would get an idea if the 4 hour attempt was going to happen. Mile 3 was 9:10 so I felt good and decided to go with it. Only problem is the first one is the easiest. Over the next couple of miles I was feeling good and running well on the downhills and on the less steep parts of the climbs but when it got steep I just didn't feel I had the power to climb as strong as I hoped and needed. I was losing too much time on the climbs and although I made up some time going down it is a losing battle . You just can't make up as much going down as you lose going up and with a lot more up than down on this course you can't afford to lose much cushion. By mile 8 I was pretty sure unless I had a miracle surge of energy on the next 2 mile climb that the attempt was over. Well I felt ok but just too slow. I passed by the 10 mile mark where I have stopped for a photo every year since 2008 when I ran with Laura MacLean but just kept going. Too bad I had no Angel to run with and get a photo because for the first time in years there was a clear view of Grandfather Mt. And I was already about 4 minutes over goal pace. From mile 2 to 10 is about the hardest part of the course and it is possible to make up a little time so I was still hoping I could at least get close to 4 hours. Maybe run a time to match what I ran on the long course. But when I got to the little climb to the Parkway just before mile 11 I had to take a walk break and just wasn't feeling too good. I did see Tim Meigs there and he had a camera so I had to run for the picture before walking the last little bit to the aid station for water and a gel. I felt better once I began the 2 mile downhill portion of the Parkway. I was running strong but not bombing down it and had a good mile 12 split. No mark at 13.1 but best guess was I went through the half in about 2:02:30. Not bad but as I began the 2 mile climb up the Parkway I was not feeling too good and the sun was bearing down on us. By mile 15 , a very slow one that had turned to a shuffle as I exited the Parkway, I was feeling pretty bad and started walking the steeper hill to the Hollowell Road Aid station and the beginning of the gravel section. Margo passed me looking strong and I knew she was going to have a great day for her. Thanks Sharon and Ricky Scott for the pic halfway. I was really struggling the next two miles having to take a lot of walk breaks, running slowly and I walked all of the steep hill up to Hwy 221. That's when I posted on FB that I was in for a death march. I was very disappointed of course and really didn't want to suffer for another 9 miles and watch very slow miles destroy any chance for a decent time. The first 1/2 mile of 221 continues at a fairly steep grade so I kept walking until it leveled out a little bit and began to run again. And surprisingly I felt pretty good. A resurgence of energy came from somewhere and I was actually running pretty well. From that point on I only walked a little bit on a couple of sections of the mostly uphill 8 miles to the finish when the grade would kick up a bit steeper for awhile. I was relieved and my attitude improved greatly as I felt so much better and knew that at least I would easily get my 2nd best finish time in 9 attempts here and could enjoy the end a little bit instead of wallowing in pain and self pity ! It was definitely a relief to finally reach MacRae Meadows and the sounds of bagpipes and drums. I ran strong up the last steep hill to the track past quite a few friends and then as usual when I circle the track in the kilt I get what seems to be a lot of extra cheers from the crowds attending the Highland Games. Number 9 finish in 4:24:40. I'll happily take that. It felt good to go back down to the marathon tent, change out of my sweaty clothes and hang around with lots of friends and meet a few more sharing our stories. Margo had done great as expected and was 3rd in her age group in 4:12. Lisa was out of shape and knew she was in for a long day so after awhile I walked back up a ways so I could see her coming. It was a relief to see her finally come into view and getting it done. Soon after she changed we were able to ride back to Boone with Dale And Alan and not have to wait on the double shuttle. Much more comfortable and great company visiting with old friends ! So I contacted Bobby to clarify the route for me and I was very happy that he was excited and willing to run it with me. So we met at 7:30 at the Earthfare lot and headed up. I was very pleasantly surprised that I was feeling no real soreness from the marathon and as we began to run I just had the normal stiffness I have for every run. Only problem was the climbing starts after just the first tenth of a mile so no time to loosen up or get the blood and breathing settled in ! We had only been a short distance when I was already breathing like I was racing a 5k and things were only going to get steeper. What had I gotten myself into? Bobby was telling me about all the people he knows that have tried and many bailed before the first mile , others have suffered and turned before 2 miles and all that have finished have resorted to a run/walk at some point. I had expected I would have to walk a lot but now I was determined that wasn't going to happen and I was feeling a lot better than I expected. But then the road got just ridiculously steep and for at least a mile my heels never touched the ground, just up on the toes digging and climbing as I tried to keep my breathing under control. Bobby was chatting away the whole time but I just kept focused on the ground in front of me, not looking at the never ending hill in front of me and would answer him occasionally with a word or two that I could muster between gasp. The first mile was 11:59. The next half mile was just ridiculously steep but I kept digging. We finally made a turn and the grade eased off. It was weird because it was still about a 6% grade but after what I had been doing it seemed flat and I was able to run strong. Mile 2 was 12:27. Then at mile 2.2 ish it just got horrible. A turn up a steep gravel drive and I thought I would have to walk but sucked it up and pushed . After a short distance we had to bushwhack for a couple of hundred yards before hitting another steep gravel road. When will it ease off ! I'm dying here ! It finally did slack off the grade a little just before I was going to keel over but now we got onto a rough rocky 4 wheeler path. Soon I could see a tower but it was a false hope as the trail got steeper once again and we still had half a mile to get to the rock and the big cluster of towers still out of view. We made that steep climb and then had a little bit of an easier section and I picked up the pace determined to do the best time that I could. Passed mile 3 in 13:17 and then one final push, a steep climb and then a bushwhack through the weeds and woods to the rock. Bobby let me lead the way there to be first to arrive and run the whole thing. I reached the top of the rock in 41:01. ! Rested a little bit and took some pictures before the quad crushing descent back to Boone. Awesome ness ! Thanks for the tour, the company and the encouragement Bobby ! Looks like you made it to the Rich Mountain summit. Was up there a couple weeks ago . . . the geezer way: car. Congrats on the race finish and the heck of a hill climb. Training update 7-20-14 and whats coming !